The Magic Lime Swing Set is a fun outdoor play toy that your kids will love having in their own backyard. There are two swings and a set of monkey bars. 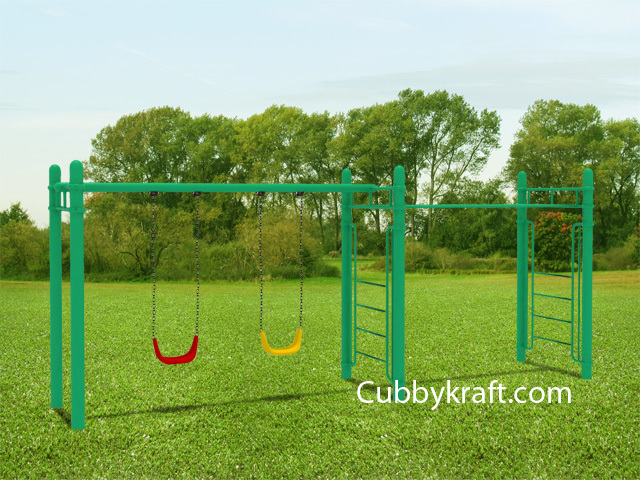 At CubbyKraft we offer a full range of swings that you can put on this swing set. These swings include an animal swing for babies and toddlers, a standing board, or a duo seat for two kids at a time. Did you know? The term is "monkey bars" because of the initial patent to the bars and the "monkey instinct" in claiming the benefits of climbing as exercise and play for children. 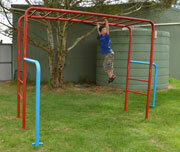 These monkey bars will add a sense of excitement and challenge for your children, right in your own backyard. There are certain ways to get kids motivated to exercise - the easiest one is by doing exciting activities that push children to use their body in a physically fit way. When you do, you should strive to have your children do things that encompass the tree elements of exercise: endurance, strength, and flexibility. The swings and monkey bars on the Magic Lime Swing Set can do all of these things. Our Magic Lime Swing Set is easy to install as it comes with a manual that contains a systematic process of putting up this particular swing set. Do-it-yourself consultants are always available to give you a hand through email and over the phone during normal business hours (see the contact link above).